Brian Burke, President and General Manager of the Toronto Maple Leafs, announced Friday evening that head coach Ron Wilson has been relieved of his duties. Replacing Wilson as the 28th head coach in Toronto Maple Leafs history is Randy Carlyle. Assistant Coach Rob Zettler has been reassigned to other duties in the organization. Hired by the Maple Leafs on June 10, 2008, Wilson compiled a record of 130 wins, 135 losses, and 45 overtime/shootout losses in 310 games behind the Maple Leafs’ bench. 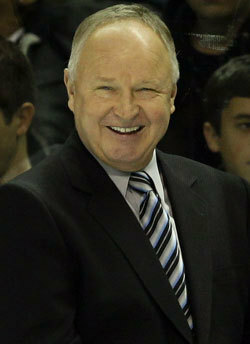 Randy Carlyle, 55, spent seven seasons as the Anaheim Ducks’ head coach. He was named the seventh head coach in team history on Aug. 1, 2005, and led the Ducks to their first Stanley Cup championship (2007), Pacific Division championship (2007) and five playoff appearances (2005-09, 2011). Only one NHL coach has won more postseason games than Carlyle’s 36 since 2005-06 (Mike Babcock). Carlyle had the most wins and highest winning percentage in Ducks’ history, compiling a 273-182-61 record in 516 regular season contests (.588 winning percentage). Carlyle’s teams earned at least 98 points in four of his six Anaheim head coaching seasons prior to 2011-12. In the most successful season in Ducks’ history, and with Brian Burke at the helm, Carlyle guided the Ducks to their first-ever Stanley Cup championship in 2007. The Sudbury, Ontario native also led Anaheim to its first Pacific Division championship in 2006-07, compiling a regular season record of 48-20-14 for 110 points that season. Carlyle becomes the 16th individual to have both played for the Maple Leafs and then taken on the reins as the team’s coach. The former James Norris Trophy winner with the Pittsburgh Penguins played 94 games on the blueline for the Blue and White from 1976 to 1978 and had two goals and 16 assists. Maple Leafs President and General Manager Brian Burke, along with newly-appointed Head Coach Randy Carlyle, will be available formally to the media on Saturday, March 3 at 10 am. The formal news conference will take place in the press conference room of the Bell Centre in Montreal.